KESCO (Kanpur Electricity Supply Company Ltd.) caters to power supply needs of around 5 lakh consumers of Kanpur city (Uttar Pradesh). The organisation has implemented a number of tools from ICT to drive consumer satisfaction and bring about reduction in aggregate technical and commercial losses (ATC). IVR based initiative. It provides free information about specific power rostering /cuts /breakdown / shutdown to consumers on their landline /mobile phones through voice calls/SMS. The consumers also have the option to accessing real time information through the website. With the intention of enhancing revenue realisation, a unique initiative called M-drishti has been initiated in KESCO. The biggest challenge of the power sector as far as revenue realisation is concerned is the high Aggregate Technical & Commercial (AT&C) losses. The AT&C losses are presently in the range of 18 percent to 62 percent in various states in India. The major portion of losses are due to theft and pilferage that is estimated at about `20,000 crore annually, for entire nation. The problem is compounded by the fact that no standard real time procedure exists for end to end tracking of anti-theft raids. Apart from rampant theft, the distribution sector is beset with poor billing (only 55 percent) and collection (only 41 percent) efficiency in almost in all States. There has been a tremendous positive response to the initiatives. Citizens are enrolling themselves to get the information via Urja Mitra and the general complaints about behaviour of division/substation officials at the time of power interruptions have reduced along with the connected law and order issues. There has been rapid rise in the number of raids for illegal usage of electricity. 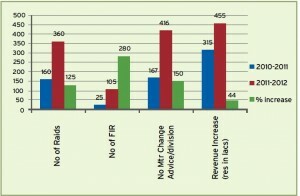 The number of FIRs filed has risen by 280 percent. The rise in meter replacement advice per month is 151percent. Services like Urja Mitra have been a path-breaker in terms of improving the consumer linkages in KESCO. The numbers of substation complaints have gone down by 16 percent ever since the online and mobile based complaint filing initiatives were launched. The organisation is also using the database of consumer mobile numbers to send billing related information by SMS. This is a free service. There has been a visible improvement in the accountability of the officers. 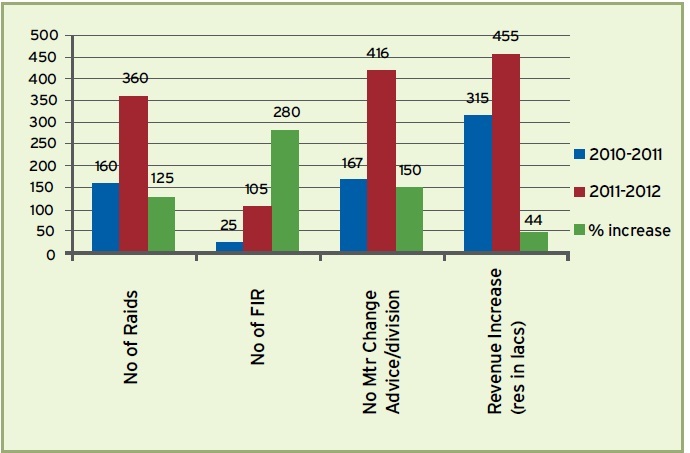 Since all revenue related information is updated on a real time basis and tracked till the full amount is realised (MDrishti), accountability of all officers is ensured. The web based monitoring portal (www.veldev.com/kesco_system) gives a snapshot of achievers and underperformers and this has helped in much better revenue realisation. Similarly web portal of Urja Mitr a also gives a snapshot of power situation to administrators and enables them to ensure rectification in time.